This report shows all activity for credit card payments processed. With a wide range of selection criteria offered, it can also be used as an auditing tool to reconcile credit card statements. 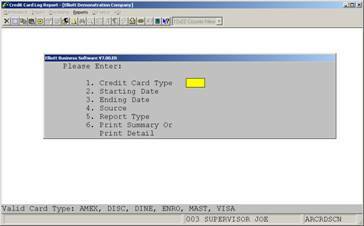 Field 1:User can enter any combination of card types for the report or press < Enter > for all. Field 4: Credit card source ID. Field 5: Report Type by 1.) Card type or 2.) By Date.